The digital camera hubs purchased as Mother's Day gift to me came with a coupon for a free Banana Peel pair of slippers. Hubs, in his note, said that he finds the gift of slippers perfect since I need a sturdy pair to continue running after our son. But I am a Mom. When I realized I could just add and pay the difference, I got a new pair of slippers for my son instead. It's his third pair, and the second one in this tyle. It's already a size 8 in baby size. Yakee wears a size 23-24 in shoe sizes now too. 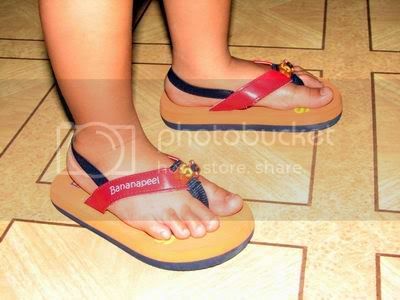 And although my son walks fine in his new slippers, I think he's not that comfy in this style. I also forgot that his skin breaks out in rashes sometimes from any form of friction (even if he's only gigil on an ice cream cone). But my heart was in the right place, surely, for wanting to happify him over myself? He's been breastfeeding all the time again... argh!